We were asked to see this patient with FUO. This is a 65 y/o man with CHF (EF~25-30%) with 6 weeks of daily fevers, now with arthralgias. He has been admitted twice with multiple negative Cxs and no diagnosis yet. Great photos Carlos. I see palmar and plantar red-thingies, which I will assume are petechiae. Maybe also some sub-ungual hemorrhages too? This has a fairly narrow differential, if the cultures are indeed negative, which would put endocarditis down the list pretty far, but not entirely out of the question. 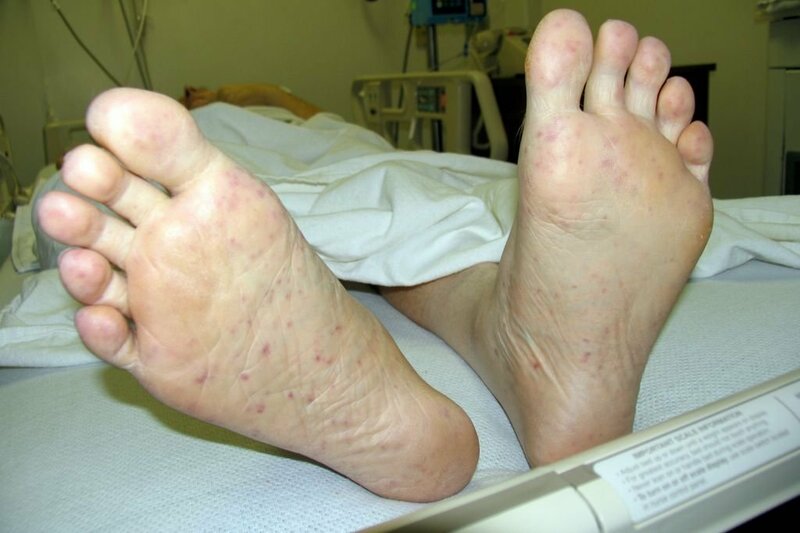 Things that come to mind, assuming this is not SBE, rocky-mountain spotted fever (any headache? ), and less lilely Q-fever. Since this is going on 6 weeks and he looks like he is still alive in those photos, I'll only mention meningiococcemia since it can cause a similar rash-he'd be dead if he had this in my opinion. 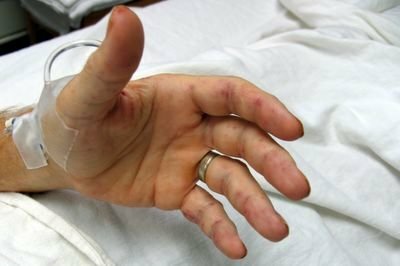 Spirochetes (Borelliosis) and other wierd critters (erlichiosis) can also cause a sub-acute syndrome associated with palmar eruptions. Syphillis can too. So...I'd want to hear about his occupational or vocational exposure to animals (if any), see his peripheral smear, get Rickettsial titers, and an RPR. I'd probably add doxycycline to his abx until you have a diagnosis. Cool pictures. I agree with DA's DDx and would certainly be concerned about a rickettsial infection. I also agree with the idea of emperic Rx if the history fits. Since you mentioned he has CHF, and those look like "splinter hemorrhages" I would also consider culture negative endocarditis (assuming subsequent cultures are also negative), good ol Haemophilus aphrophilus etc. I would also consider vascultis. Is there any evidence of renal involvement? I would get a skin Bx and a TEE, and keep those cultures cooking. I had the same thoughts as Doug. His surface echo showed no vegetation but with Janeway lesions, splinter hemorrhages and fever beyond the duration of viral syndromes I am still thinking of persistent endovascular infection. He came in this past week so Cxs are cooking, he will have a TEE soon and in the mean time he is on Rocephin (for HACEK and Cx- endocarditis) and doxy (for Coxiella/Q fever endocarditis). I thought the lesions were quite dramatic though. I will post updates as they develop. Good photos. Have you thought about uploading them to Wikipedia when you have the final diagnosis? 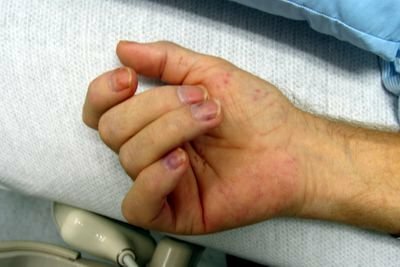 What about ITP (thrombocytopenia) with associated petechiae? I forgot to list his CBC... his WBC is up but his platelets are normal. Also about the endocarditis, maybe C. psittaci (hard/impossible to culture), does he have any birds? What would you do next again? Effusion, ascites, and liver nodules, Oh my!